The 2018 International Production & Processing Expo (IPPE) projected to bring together more than 1,150 exhibitors and 30,000 visitors to Atlanta, from Jan. 30 - Feb. 1, 2018. The tradeshow focuses on bringing together leaders in the poultry, meat and feed industry from all over the world. IPPE’s global reach attracts more than 8,000 international visitors from 129 countries. Kaeser container solutions are tailored to individual customer needs and can be operated in temperature ranges from -58 °F (-50 °C) to 113 °F (+45 °C). Ambient temperatures over 113 °F (+45 °C) require alternative turnkey solutions. Low-temperature steels are used for temperatures below-58 °F (-50 °C). The compressor packages are manufactured according to specific customer and country requirements. The systems are tested at the Kaeser plant where the agreed operating parameters are preset. If the compressed air installation comprises multiple containers, they ensure they can be operated as a single unit, as well as in combination with one another. The system operates in conjunction with the Sigma Air Manager 4.0 Master Controller for best possible load efficiency. This type of installation reduces on-site compressor installation time to a minimum. At the Kaeser plant, they are able to operate and test multiple containers in combination and can even emulate system communication with a simulated control centre. The containers are insulated steel units and feature ISO container corners. The containers are statically designed in such a way that they can be lifted at the upper container corners. They are completely piped and wired, and include a control cabinet with power sub-distribution, an automatic ventilation system, a heater, lighting and emergency lighting. The design is implemented in accordance with customer requirements and requests. Kaeser uses insulated containers specially produced for each specific application. Insulated containers ensure far better thermal conditions within the container than non-insulated containers and prevent condensation from occurring on the inside. A further advantage is sound reduction and the minimization of acoustic emission to the environment. All openings are reinforced to ensure the structural strength of the container is maintained. Rain protectors are installed above the openings in order to prevent rainwater ingress. 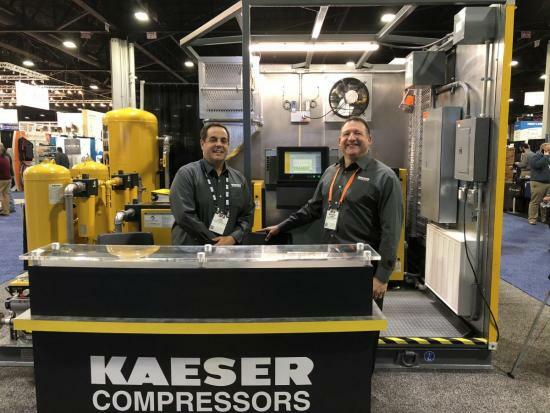 Joe D’Orazio and Michael Camber (left to right) at the Kaeser Compressors booth. JAX is an industrial lubricant manufacturer focused on formulating high-performance synthetic lubricants, fleet and heavy-duty lubricants, industrial lubricants and biodegradable and food-grade lubricants. Jax offers 100% synthetic air compressor fluids for severe operating environments. One such example would be the Compresyn HD PGE Series fluid. These are synergistic blends of synthetic polyglycols, pentaerythritol esters and selected additives formulated to provide superior performance and extended drain capabilities in rotary screw compressors. Formulated to provide 8,000+ hour drain intervals, these fluids can be run continuously for one year, eliminating fluid and labor related downtime costs during this time. The PGE Series fluids provide sealing between the rotors and the stator. Their thermal conductivity removes the heat of compression, allowing the compressor to run cooler while lubricating the rotary element bearings. The PGE Series fluids are also fully formulated synthetic compressor fluids containing no hydrocarbon-based fluids. They are highly resistant to sludge and varnish formation, and provide solvency characteristics for cutting through and dissolving varnish buildup. 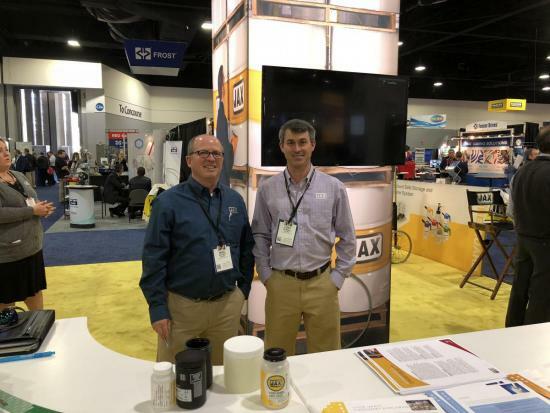 Mike Rooney and Cory Russell (left to right) at the JAX booth. Baldor showcased their stainless steel NEMA motors. The motors have an IP69K rating. The smooth finish with curved contours meets NAMI (North American Meat Institute) guidelines for ease of cleaning and allows water to shed from the frame of the motor, minimizing the chance of liquid pooling. All hardware (through bolts, drain plugs, etc.) have smooth heads to eliminate pooling and catch points. A rounded conduit box also minimizes catch points where bacteria and other microorganisms can harbor and multiply. Two barrier mechanical seals prevent water from entering the motor. The viton material is chemical resistant, withstands high temperature and directs spray. Fully encapsulated windings extending into the conduit box ensure the motor is sealed effectively inside and out. The vacuum impregnated process ensures there are no air pockets in the encapsulation. Bevan Christiansen at the Baldor booth. Motion Industries talked with booth visitors about using pneumatics in the poultry industry. As automation continues to become more popular, pneumatics continues to become a more viable solution. Applications include sorting, handling, conveying and packaging. Pneumatics use directional control valve component applications to provide linear and rotary motion using cylinders, grippers and rotary actuators. According to Alan McCay, Motion Industries Pneumatics Product Manager, the poultry industry has some unique conditions to deal with. Components are subjected to both hot and cold temperature extremes, high-pressure wash-down and harsh chemicals. You also must pay attention to hygienic challenges where contaminants can get trapped in small spaces and must be cleaned. Components must be designed to eliminate grooves or small spaces where contaminants can collect. The AVENTICS CL03 Clean Line series of valves were specifically designed to handle high-pressure wash-down applications. There is no need to mount the valves in a cabinet - the high flow Clean Line valves have an IP69K rating. The hygienic design allows for easy cleaning - withstanding up to 1,450 psi wash-down. Products rated to IP69K must be able to withstand high-pressure and steam cleaning. The test specifies a spray nozzle is fed with 176 °F (80 °C) water at 80–100 bar (~1160-1450 psi) and a flow rate of 14–16 L/min. The nozzle is held 10–15 cm from the tested device at angles of 0°, 30°, 60° and 90° for 30 seconds each. The test device sits on a turntable that rotates once every 12 seconds. In poultry plants, says McCay, there can be areas with dramatic temperature swings, which can cause water to condense in compressed air lines. In areas where it is not feasible to install an air dryer, SMC AMG series air filters are used at the point of entry before a pneumatic control valve. The AMG contains an element specifically designed to remove 99% of the water droplets. Removal of the water in a pneumatic system can help reduce corrosion of pneumatic components, therefore increasing life and decreasing downtime. Alan McCay, Dudley Sheppard and Brad Burton (left to right) at the Motion Industries booth. Airgas discussed alternatives to more typical refrigerants found in mechanical chiller processes. Airgas’ primary alternative is cryogenics, where gases such as liquid nitrogen, carbon dioxide and oxygen are utilized. Bill Adams, the Director of Food & Pharmaceutical Solutions spoke to me regarding the benefits of cryogenics, “It really depends on the customer’s production operation. If they have a very small footprint and they need to hit temperatures of -148 °F (-100 °C) to -292 °F (-180 °C), you’re probably going to be looking at cryogenics.” Cryogenic freezing or chilling systems are relatively easy to operate, however the initial system design is critical to meet performance objectives. Airgas engineers will run a plant survey to find the correct gas solution and system, customizing for the individual client’s needs and production demands. This process includes determining the most efficient gas storage, piping, freezing or chilling equipment and exhaust systems. Ben Stevenson, Tim Morris, Chuck Cory and Bill Adam (left to right) at the Airgas booth. Bitzer focused on their expansion to meet the demands of the industrial and commercial market with a series of screw compressor packages designed specifically for ammonia with the Bitzer Ammonia Compressor Package (ACP). All of Bitzer’s ACP packages can come equipped with a variable frequency drive. The VFD ensures system stability and a more efficient part load performance than other unloading methods. Furthermore, multiple compressors greatly increases part load efficiency by keeping running compressors closer to full load, where the efficiency is highest. They also utilize internal check valves on the compressors to prevent the rotors from spinning backward when the compressor is off. An oil solenoid/stop valve is also featured to ensure oil does not flow while the compressor is not running. These features remove the need for a suction check valve eliminating unnecessary pressure drop and wasteful system inefficiency. Art Mathews at the Bitzer booth. Fricon showcased their FMCS-P Series Modular Chiller System, Premium Series. Its air-cooled condenser satisfies a wide range of capacities. The modular design allows it to work independently in capacities between 15 to 50 TR or grouped in different combinations of sizes to form one or various sets. These meet the requirements of capacities up to 645 TR per set. Fricon uses the Bitzer Ecoline semi-hermetic compressors with infinite variable capacity control “CRII” between 10% and 100%, or the implementation of an external VFD on the master unit. This results in a greater adaptability to the thermal load of the set, stabilizing the fluid temperature and maximizing energy savings at partial load. Standard ambient operating temperature range is 110 °F (43 °C) to 40 °F (4 °C). Extended ambient operating temperature range is 125 °F (52 °C) to -35 °F (-37 °C). Fernando Escuela at the Fricon booth. Trane focused primarily on the concept of turning farm waste into methane as a way to generate further revenue for farmers. Most methane generation projects are focused toward “mega-farms” where as Trane focuses on medium sized applications, with their first project being a 500 head dairy farm. These demographics are rarely utilized in the process of methane generation. The process provides a reduced carbon footprint, reduced odor issues, reduced water pollution and improves reuse water quality. Depending on discharge quantities and digester performance, it may provide additional benefits such as power generation, fleet fuel, or pipeline injection. Michael Snow, Don Yochum, Matt Walton and Nathalie Shaffer (left to right) at the Trane booth. Evapco showcased their Critical Process Air Systems. The unit is designed to condition recirculated air and outside air during production mode. Recirculated and outside air is filtered with pre-filters. The air is then cooled or heated as required to maintain the room return air temperature and humidity. The air then passes through the final HEPA 95 or 99 filter before being supplied to the room. CPA units are also available with an optional “free cooling” mode to increase efficiency. When conditions are favorable, the enthalpy economizer mode will open the outside air dampers on call for cooling and close the return dampers. The unit can also control room pressure utilizing the outside air and return air dampers to pressurize. Exhaust fans (remote or integral) are used to relieve the pressure. During the optional cleanup mode, the CPA air-handling unit is designed to condition 100% outside air. The outside air will be cooled or heated as required to maintain the supply air temperature, before being supplied to the room, purging the room of moisture and chemical produced during the washing process. Felipe Montenegro, Elizabeth Fox, Jeremy Amos and Max Duarte (left to right) at the Evapco booth. Cantrell specializes in innovative solutions in the poultry and food processing industries. One product line showcased was their Vacuum Transport System. This was designed to help clean the plant while reducing labor and water usage. The Vacuum Transport System can come in a variety of sizes in order to support plant specifications. Cantrell specifically engineers and develops each individual system based on their clients’ footprint and needs. Their Vacuum Transport System can be integrated with Cantrell’s own PC-based master controller system in order to have complete automated control over the entire vacuum line. Dane Woods and Jesse Jones (left to right) at the Cantrell booth. Becker showcased a wide variety of vacuum pumps, particularly the U 5 series. The U 5 series is a rotary vane oil-lubricated vacuum pump. These are primarily suited for the vacuum packaging of food. These can be used across a wide range of applications, including vacuum chamber machines, form-fill-seal machines and modified atmosphere packing (MAP). Ultimate pressure is 0.1 mbar abs. Two gas ballast valves are available, 0.5 mbar abs comes standard, and the optional <3mbar abs. Water vapor tolerance is 7 mbar at 185 °F (85 °C) operating temperature (standard gas ballast). Water vapor tolerance is 50 mbar at 185 °F (85 °C) operating temperature (optional gas ballast). The U 5 Series provides vacuum to 29.9 in.Hg (0.4 Torr). Jim Sherman, Eric Schmitt, Betty Espino-Barros, Steve Gilliam, Darin Ladd, Jason Rathbun and Mick Wentzel (left to right) at the Becker Pumps booth. The International Production & Processing Expo (IPPE) is a collaboration of three shows - International Feed Expo, International Meat Expo and the International Poultry Expo - representing the entire chain of protein production and processing. The event is sponsored by the American Feed Industry Association (AFIA), North American Meat Institute (NAMI) and U.S. Poultry & Egg Association (USPOULTRY). To read more about Food Industry Applications, please visit www.airbestpractices.com/industries/food.